Salad isn't just a meal for dieters. For decades, variations have been dressed up with fruits, cheese, meats, and, in rare cases, whipped cream. In honor of National Salad Month, we’re serving up information on where and when your favorite salads were created. Legend has it that this tasty blend was created by accident. In 1937, Robert H. Cobb (er, Bob Cobb), owner of L.A. eatery The Brown Derby, was scrounging around for a nighttime meal when he came upon an avocado. 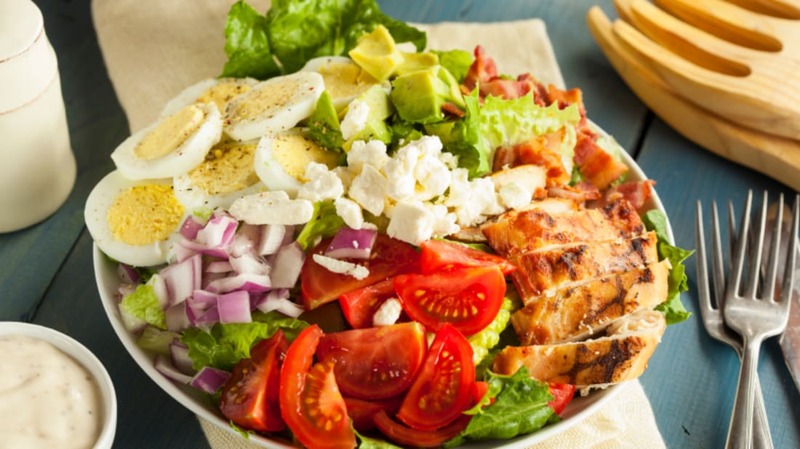 He chopped it up and threw in some romaine, watercress, tomatoes, chicken, hard-boiled egg, cheese, some leftover bacon and tossed with the Derby's famous French dressing. As the story goes, word spread of his delicious invention after he fed it to Hollywood promoter Sid Grauman, who fell in love at first bite. Soon it was added to the restaurant’s menu. Two different Italian chefs are credited for creating this Parmesan cheese-laced favorite. Most historians point to Caesar Cardini, a San Diego-based cook who ran a restaurant just over the Mexican border in Tijuana to avoid the United States’ prohibition laws. Over a busy Fourth of July weekend in 1924, Cardini was running low on supplies, so he threw together a salad with the ingredients he could find in his kitchen: romaine lettuce, garlic, croutons, Parmesan cheese, boiled eggs, olive oil, and Worcestershire sauce. An unsubstantiated story in George Leonard Herter’s book, Bull Cook and Authentic Historical Recipes and Practices, Volume II, however, credits a man named Giacomo Junia for making the dish. Herter claims that two decades before Cardini’s busy holiday weekend, Junia served the salad at his Chicago eatery, The New York Café. What’s certain about this so-called “King of Salads” (made with crab meat, avocado, tomatoes, and asparagus) is it debuted on the West Coast. Exactly when and where, however, is up for debate. Some say it was born at Seattle’s Olympic Club in 1904 when Metropolitan Opera Company tenor Enrico Caruso ordered the dish again and again until there was none left. But other theories abound. In her West Coast Cook Book, Helen Evans Brown asserts it was first served at San Francisco spot Solari’s in 1914. And representatives from The Davenport Hotel in Spokane, Washington insist it was their founder and owner, Louis Davenport, who invented the dish for the hotel’s restaurant. A delicious combination of meats, cheese, minced sweet pickles, and a mayonnaise, mustard, and egg dressing, this meal was first dished out at the J.L. Hudson Department store in downtown Detroit. The 25-floor shop shuttered in 1983, but the salad lives on at the Lakeshore Grill inside Macy’s stores. Waldorf Astoria Hotel maître d’ Oscar Michel Tschirky is credited for preparing the apple, celery, walnut, and mayonnaise mix for the NYC spot’s pre-opening fête in March of 1893. Later dubbed “Oscar of the Waldorf,” he continued working at the swanky establishment for another 50 years. The first American gelatinous salad can be traced to 1904. Mrs. John E. Cook of New Castle, Pennsylvania entered a dish in a local contest that she called Perfection Salad—and walked away with third place. The recipe for the gelatin mold (which contained cabbage, celery, green pepper, and pimentos) became increasingly popular. By the 1960s the Jell-O-as-salad concept was so in fashion that the brand released vegetable flavors such as celery, Italian salad, and seasoned tomato. Yet another invention dreamt up by the makers of Jell-O: The ingredients for the Watergate Salad were first printed on the sides of the brand’s pistachio pudding mix in the mid-'80s. At the time, they dubbed the combination of pudding, pineapple, pecans, and whipped cream the Pistachio Pineapple Delight, but in 1993 they added mini marshmallows to the mix and updated the moniker. The dessert salad is a Southern Christmas tradition. According to Serious Eats, the first written reference to the treat was in the 1867 cookbook, Dixie Cookery: or How I Managed My Table for Twelve Years. North Carolina resident Maria Massey Barringer suggested layering coconut, sugar, and pulped oranges. By the 1880s, the recipe had evolved to include sliced pineapple and whipped cream, and by the early 1900s cooks were tossing in other fruit such as bananas and strawberries.